Ḍaṅgara te hora kahāṇīāṃ. [lekhaka] Karatāra Siṅgha Duggala. Dillī : Nawayuga Pabalisharaza, . From the University of Chicago Library. ਡੰਗਰ Dangar by ਕਰਤਾਰ ਸਿੰਘ ਦੁੱਗਲ . This is a collection of short stories by celebrated author, Kartar Singh Duggal. I’ve seen three different translations for ਡੰਗਰ so far: animal, donkey, and cattle. Not sure which, if any, is accurate. How great is this cover?! 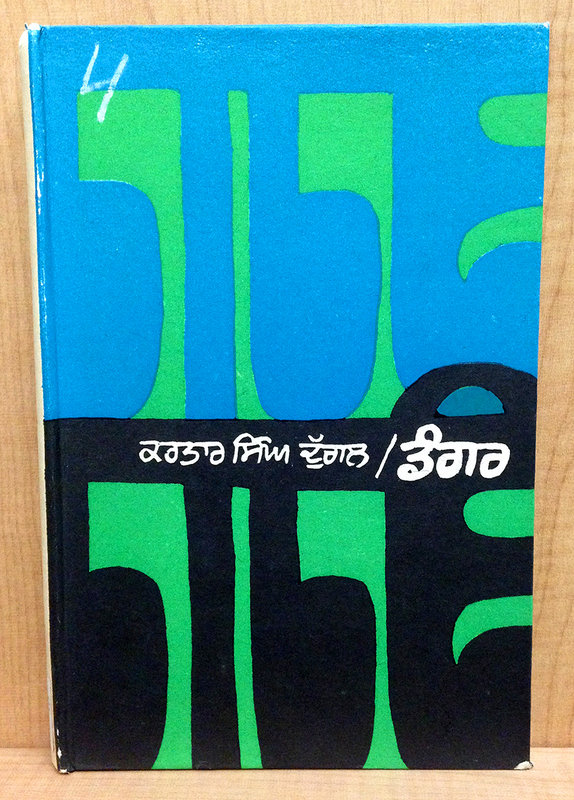 So if you hadn’t noticed, the black and blue shapes are silhouettes of the title, ਡੰਗਰ, backward. The roughness of the cutouts really matches the feel of the thick, quick white writing. I really dig this raw, handmade aesthetic.